Children's Picture Book Database at Miami University | Well, i never! One day things become very strange for a family living in Iowa. Nothing seems to go as planned. They finally figure out that this is because their farm has floated up into the sky. They get their farm back to earth by weighing it down. 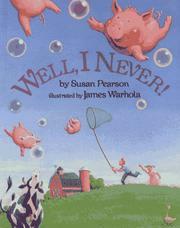 Pearson, Susan, “Well, i never!,” Children's Picture Book Database at Miami University, accessed April 18, 2019, https://dlp.lib.miamioh.edu/picturebook/items/show/10241.